REDWOOD CITY, CA – In the last several years Shinnyo-en Buddhists have conducted the Saisho Homa fire rite ceremony in Taiwan, Paris and Berlin. 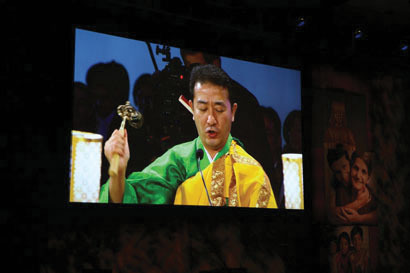 This year, the prayer ceremony for world peace was brought to the U.S. for the first time and documented by Gorilla Production Group with AV technical support from Video Applications Inc. (VAI). The ceremony, held at Shinnyo-en's head temple in Redwood City, CA, was led by Her Holiness Shinso Ito, one of the few female Buddhist priests, who traveled from Japan for the event. Covering the ceremony for an overflow crowd and for followers worldwide posed numerous challenges, including being as unobtrusive as possible during the rite, dealing with space constraints and servicing two locations at a second venue. "You only get one shot at an event like this – the ceremony happens once, is recorded for all time and remains in the archives of the [temple] forever. That's pretty important," said producer Paul George of Gorilla Production Group. "We have been working with Shinnyo-en for years now doing special events all over the U.S. I work with VAI a lot; it's a company I turn to for difficult, high-end AV support for my customers, and I knew they would meet the needs of this complex project." George involved VAI about five months before the event was scheduled so the company could conduct two site surveys, hold several production meetings and deal with many logistical issues. VAI provided six Sony HD video cameras and Ikegami and Sony robotic HD cameras to cover the Saisho Homa fire rite ceremony at the temple, which seated several hundred people. "There wasn't a lot of space, and there were places where we couldn't set up the cameras," said VAI's Shawn Oatey, who acted as project manager. "We needed to be unobtrusive yet cover the rite with eight cameras, two of them robotic, the others handheld and Steadicam. There was a procession and recession, so we had to move in and out then find angles to cover Her Holiness facing the altar, her hand movements, the ritual bell ringing and the fire." VAI also had to determine where to locate the video village and support services. They were ultimately housed down the hall in a former dormitory. (The building had previously served as a convent). But that just accounted for the main temple. To accommodate close to 2,000 people who couldn't attend the temple ceremony, two overflow sessions were set up about 1.5 miles away at Canada College in Redwood City. It was a physical challenge to link the venues, so the college did not get a live feed from the temple. Too distant to set up a cable run, the college instead received a tape delay of the rite delivered on hard drives. During the temple ceremony, the show and ISOs of all of the cameras recorded onto 23 AJA KiPro Digital Recorders as well as HD tape decks. Once the first half of the ceremony was recorded in the temple, two KiPro hard drives were delivered to the college for playback in the gym and theater where overflow crowds were eagerly waiting. The second half of the rite was delivered the same way with about an hour's tape delay overall. "It took a lot of coordination to get the just-recorded content to the remote venues," George points out. "We had to sync decks seamlessly from the first half to the second half of the show. Then the record tapes were shuttled over to a broadcast station in San Francisco for uplink to Japan. Within 24 hours about 110,000 people saw the ceremony. Later, they could edit the event in Japan and distribute DVDs." VAI also provided two projection screens and two projectors for the gym plus another pair of screens and projectors for the theater. An HD camera was supplied to each venue for I-Mag when Her Holiness paid a visit to the campus following the temple ceremony. In addition, VAI furnished a speaker array for audio support at the college along with a small sound system for a Taiko drum stage on the campus. A large complement of mics was deployed for the temple rite and the campus visit. "Coordinating the AV at three different venues with great success is the kind of thing I rely on VAI to do," said George. "VAI's staff is very experienced at all levels – they know what it takes to get the job done." VAI's Shane Zinke was lead video engineer for the fire ceremony at the temple with Carl McMillan video engineer; Geof Gibson served as video engineer at the Canada College venues. Michael May was senior account executive. For more information, please visit www.videoapps.com.